MARIENVILLE, Pa. – The small town of Marienville in southeastern Forest County serves as one of the main gateways to the vast Allegheny National Forest, and it’s long been a haven for outdoor enthusiasts seeking to access the forest’s many attractions. Soon, however, visitors will also be able to enjoy a recreational destination right in the heart of downtown. Community organizers in Marienville are working to develop the four-season Knox-Kane Trail and a recreational hub at the town’s historic train station, a stone’s throw from the main intersection at the center of Marienville. In time, they anticipate the project will provide new recreational opportunities for community members and visitors, encourage local economic development, and connect nearby communities to Marienville and the ANF. The rail line that the rail-trail is being built upon was developed in the late 1800s as part of the extensive Baltimore and Ohio Railroad, and it provided a freight line between Knox in Clarion County and Mount Jewett in McKean County. After the need for freight transportation declined during the second half of the 20th century, the passenger Knox and Kane Railroad developed and ran excursion trains along the line from the early 1980s to the early 2000s. 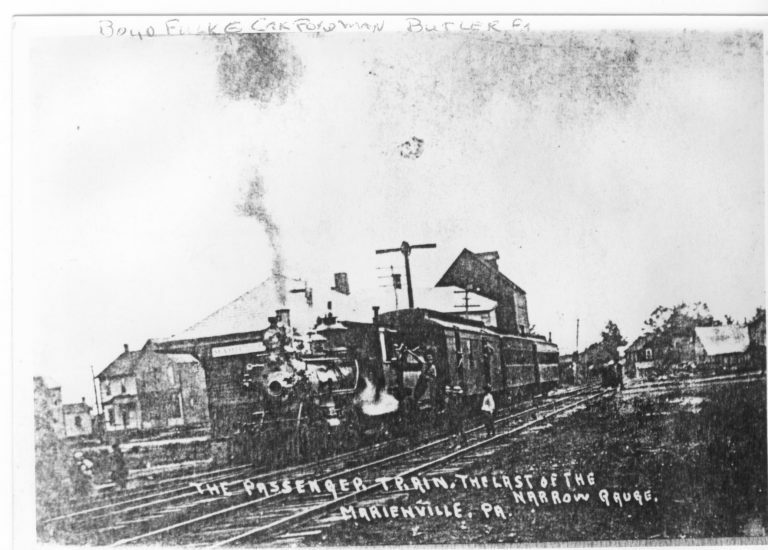 Once the passenger train ceased operations, community leaders in Marienville saw an opportunity to develop a recreational resource for their town. They developed extensive plans for the trail as well as a recreation hub and began gathering funding and support for the project. A $5,000 grant from the Lumber Heritage Region allowed for the creation of a conceptual plan (below), which shows the planned layout of the downtown hub. Marienville’s planned recreational hub will feature amenities for walkers, bikers, equestrians, snowmobilers, local merchants, gardeners, history buffs, and more. Photo by Danielle Taylor. Marienville’s planned recreational hub will feature amenities for walkers, bikers, equestrians, snowmobilers, local merchants, gardeners, history buffs, and more. In May, Governor Tom Wolf and PennDOT Secretary Leslie Richards announced that Jenks Township will receive nearly $1.2 million in funding from the Surface Transportation Block Grant program to construct six more miles of trail, handicap-accessible parking lots, and a pavilion. An additional Appalachian Regional Commission Grant for $67,000 will help renovate the historic train station to include handicap-accessible bathrooms and an information center highlighting recreation activities and destinations available throughout the region. $162,000 from a USDA Secure Rural Schools resource advisory committee have already allowed development of nearly two miles of the trail, which is already open to the public. For nine months of the year, the trail will be open to walkers, bicyclists, and other non-motorized trail users, and during the winter, it will be open to snowmobilers and cross-country skiers. 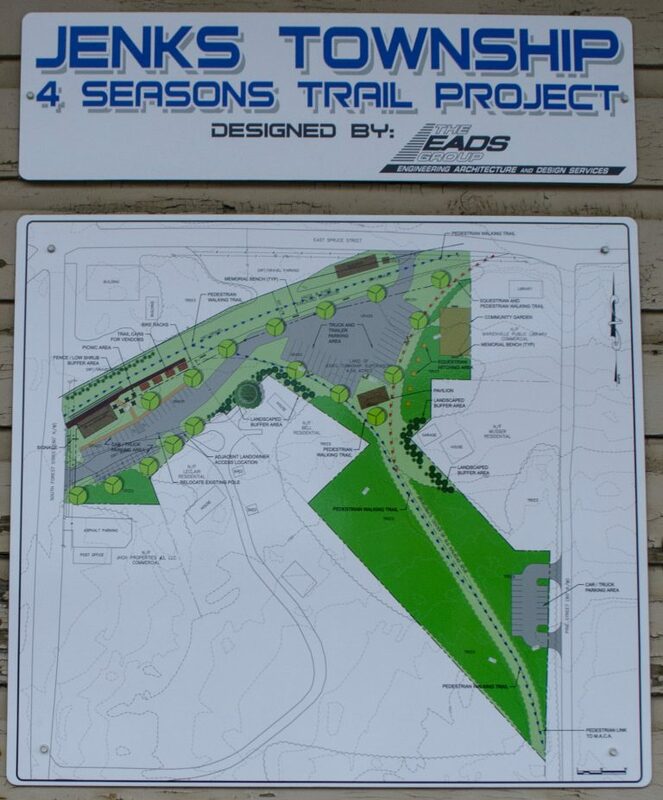 Jenks Township Supervisor Kevin Carter is overseeing the execution of the trail project, which will also include a community garden, interpretive signage, seating for visitors, equestrian facilities, and more. He hopes to develop the train station into a community museum of sorts and also bring in elements such as a market village to attract visitors. Ultimately, the plan is to connect it with other trail development along the line, primarily the Rail 66 Country Trail that currently extends from Marianne to Leeper, as well as intersecting trails, like the North Country National Scenic Trail, which passes through the Pennsylvania Great Outdoors region on its route from North Dakota to New York. The present train station in Marienville is the town’s second, and it has been in place since at least 1910. Photo courtesy of Jenks Township. In the meantime, he hopes people will enjoy the trail as it comes together and will begin taking advantage of the sections already completed. 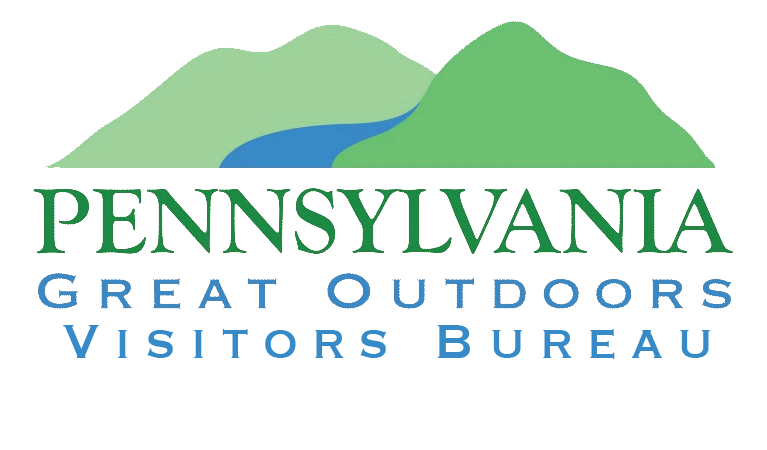 Learn more and find other interesting places to explore in the Pennsylvania Great Outdoors region by going to VisitPAGO.com or calling (814) 849-5197.